Experience one of Nova Scotia’s most picturesque places on this half-day trip to Peggy’s Cove from Halifax, with convenient, comfortable round-trip transport included. Receive an informative overview of this popular area from your friendly onboard guide, and then take a self-guided tour to explore the small fishing village at your own pace. Don’t miss the Peggy’s Cove Lighthouse, one of the world’s most iconic lighthouses! 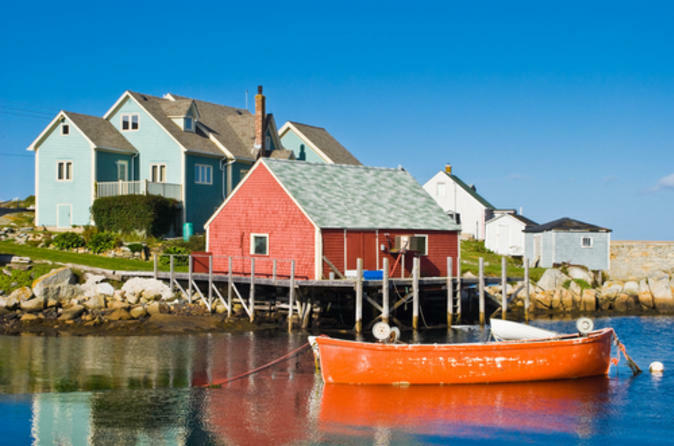 Board a comfortable coach at the Maritime Museum of the Atlantic in the afternoon and relax on your scenic journey southwest to Peggy’s Cove, a small rural community on the eastern shore of St Margaret’s Bay located less than an hour away from Halifax. Along the way, your friendly, knowledgeable guide will offer an interesting and informative overview of this area. When you arrive, you’ll understand why this postcard-worthy fishing village is an artist’s paradise. This independent tour gives you the flexibility to create your own schedule and explore at your own pace, so the afternoon is yours to spend as you please. Soak up the quaint charm of the fishing village, settled by Germans in 1811, as you walk along the seawall and enjoy views of the rugged Atlantic coast. In the village, browse shops, wander down tucked-away side streets, and grab a bite to eat at one of the many fine restaurants or cafes (own expense). If you’re feeling adventurous, there are several activities to choose from: hiking, kayaking, fishing, golfing, whale watching (seasonal), bird watching and more (activities at own expense). Don’t miss the Peggy’s Cove Lighthouse, one of the most recognizable lighthouses in the world! Walk along Lighthouse Trail and capture photos of the classic red and white lighthouse, situated on an extensive granite outcrop. This lighthouse is still operated by the Canadian Coast Guard. After your Peggy’s Cove day trip, relax on the drive back to Halifax.